Readers far and wide! 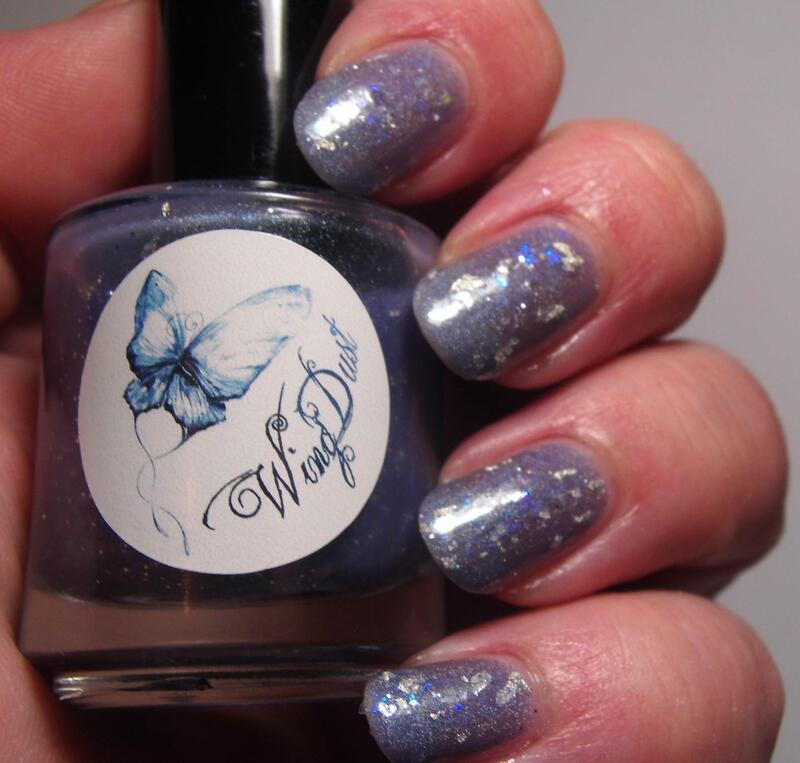 I have a lovely pair of Wingdust Collections polishes to show you today. I received these as a giveaway prize from their Facebook page and I cannot begin to tell you how delighted I was to receive them…not to mention the glass nail file (my favorite one so far) and Canadian candy that was in the package too! First up is a lovely girly that is perfect for summer! This is Funhouse! Funhouse is a bright pastel lavender crelly based polish filled with neon pink, pastel pink, aqua, and bright purple glitters in a multitude of shapes and sizes. It would be a tragedy for me not to mention the lovely subtle shimmer that runs throughout the polish. There are triangle and star glitter in here so it’s a WIN for me! I have a small collection of Wingdust Collections polishes now and I have encountered nothing but greatness. For a crelly-based glitter which can sometimes present some challenges in application this one is really top of the heap when it comes to glitter dispersion and application. I didn’t have to fish for the shaped glitters and I didn’t have any troubles applying the polish. 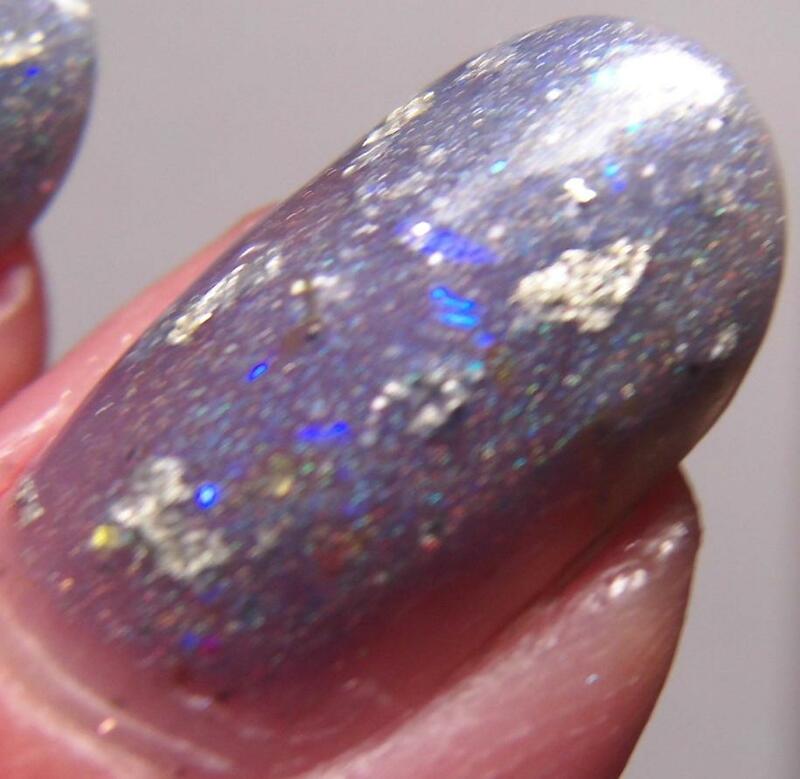 Pictures show two coats plus a glitter smoothing topcoat and a shiny topcoat. Next up is After-Party @ Jimmy’s! I LOVE this one. It’s every single thing that I love about indie nail polish. Unique? Check! 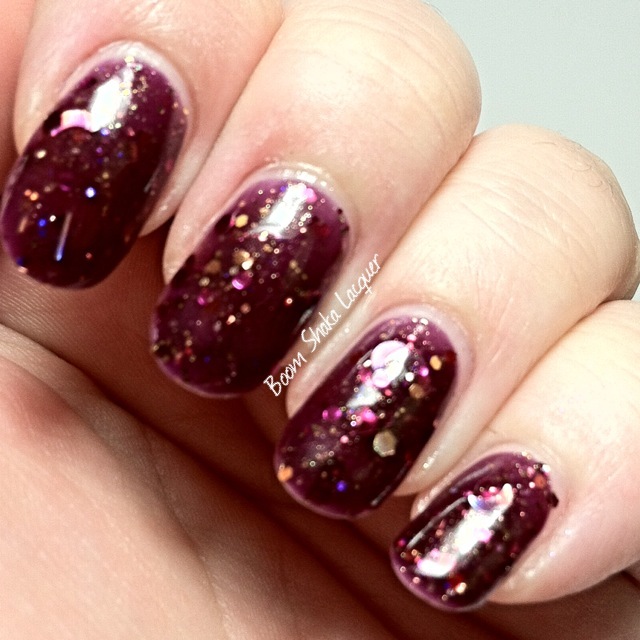 Jelly-based glitter bomb? CHECK! Star Glitter? checkCheckCHECK! Doesn’t hurt that it’s in my go-to color family either…I’m just super drawn to blues and teals and this one has both…score! 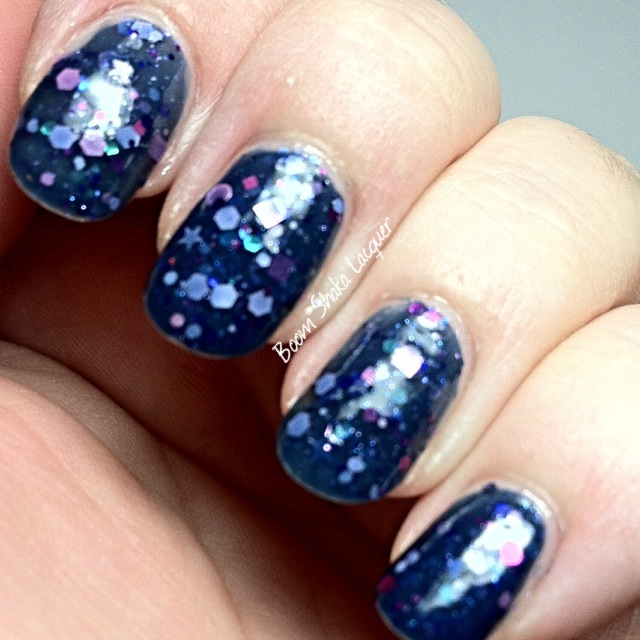 After-Party at Jimmy’s is a dark blue/blurple jelly base packed with shimmer. There are navy, lavender, pastel pink, magenta and teal glitter is several shapes (including triangles and stars!) and finishes. The thing that I’ve come to really enjoy about Wingdust Collections is the ease of use. I think that even polishers who aren’t familiar with these kinds of polishes would find it relatively easy to apply. I didn’t have any problem with getting glitter on the nail or spreading evenly. 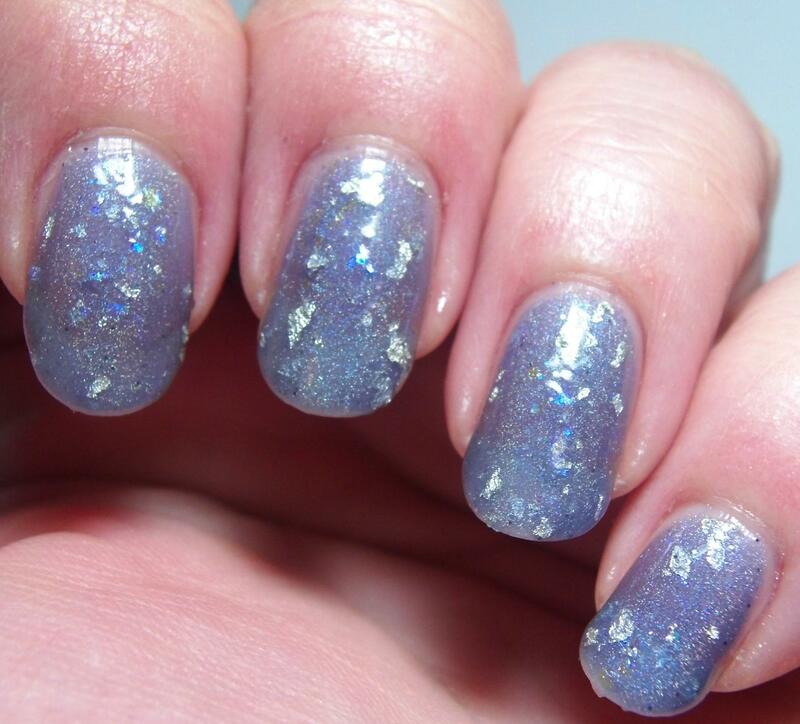 Because of the jelly base it has a delicious depth to it that you just don’t get with non-jelly based polish. There is a trade off of translucency but this was still only two and a half coats plus glitter smoother and topcoat. So what do you think? Gonna be adding a few Wingdusts to your collection? I highly recommend that! You can get Wingdust from her Etsy Store. Not to mention you can follow Wingdust on Facebook and Instagram to keep up to date on all the latest news. Wingdust is also available at different stockists around the world so that anyone anywhere can get their own bottle of Wingdust. 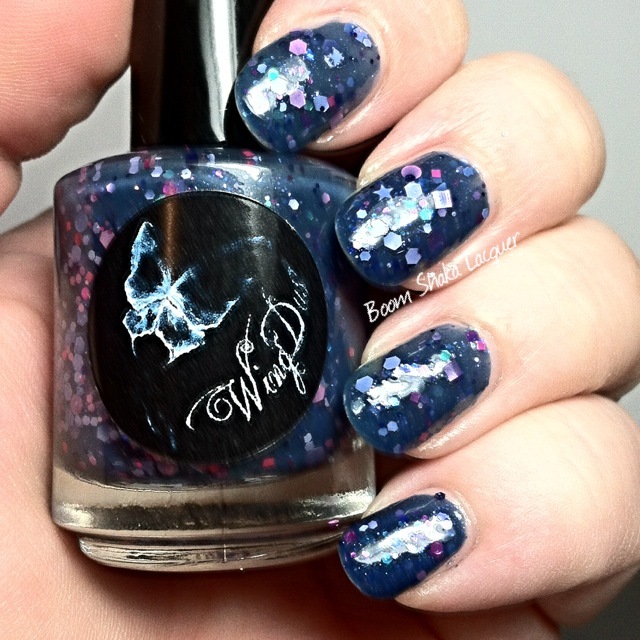 This entry was posted on August 9, 2014, in Indie Polish, Wingdust Collections. Ok so ya’ll know I love blue and teal and green. But I also love PINK which is why I decided to start this series of pink posts! I don’t know how long I’ll keep it up but I really kind of like them so we shall see! Today I have a beautiful polish to show you. 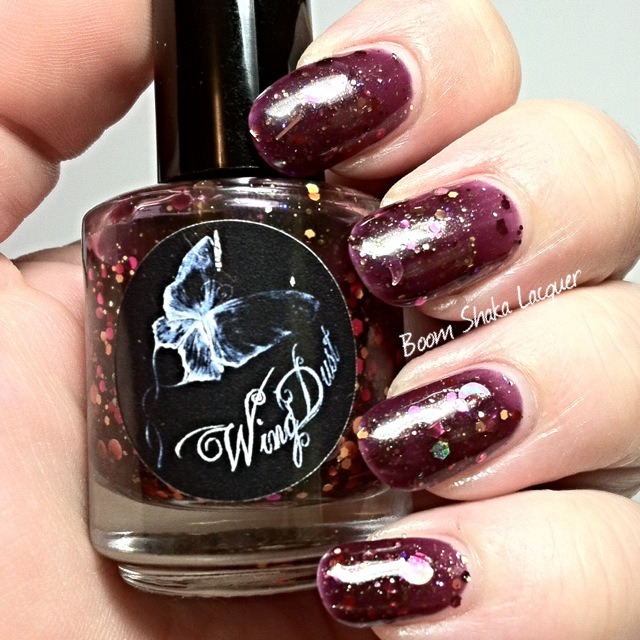 Wingdust Collections Beach Bum! Beach Bum is a luscious squishy hot pink jelly packed to the brim with all kinds of wonderful glitter! I see tiny coral hexes, pink metallic dots, small silver holographic hexes, big silver holographic dots. Basically a bunch of really awesome glitter! The formula is really easy to work with and I had no trouble getting a decent glitter spread and good coverage in 2.5 coats. Because of the length of my nails the free edge has a really prominent nail line and sometimes with jelly polishes it takes a little extra on the tips to combat that for photos. 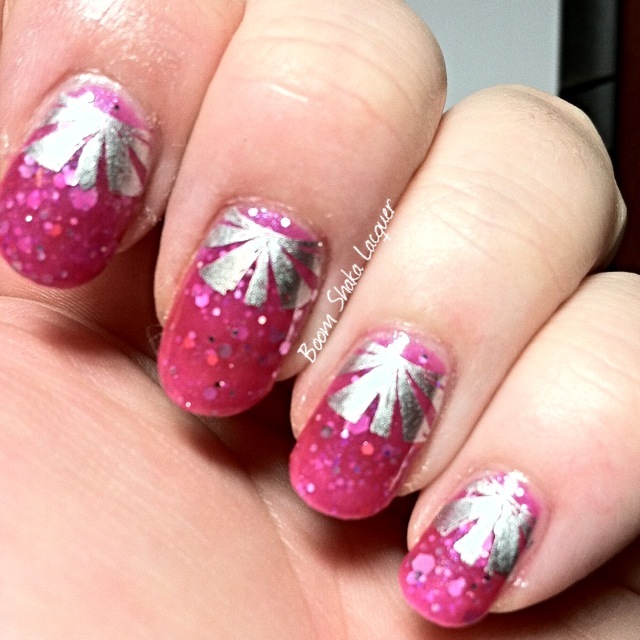 I wore it with a stamped design that I did by using one of those dreaded french tip stamping plates. Those things never “fit” my nail properly and I was staring at the one I have (you know you all have one too) and I thought “HEY, if I flip it it’ll be a HALF-MOON design” whaaaat. That was pretty much how it went. Anyway I used Sally Hansen – Silver Sweep to do the stamping and I was really pleased at how it turned out! Polishes used: Sally Hansen – 4-in-1 Complete Treatment; Wingdust Collections – Beach Bum; Sally Hansen – Silver Sweep; Digital Nails – Ain’t Nobody Got Time for That Topcoat. 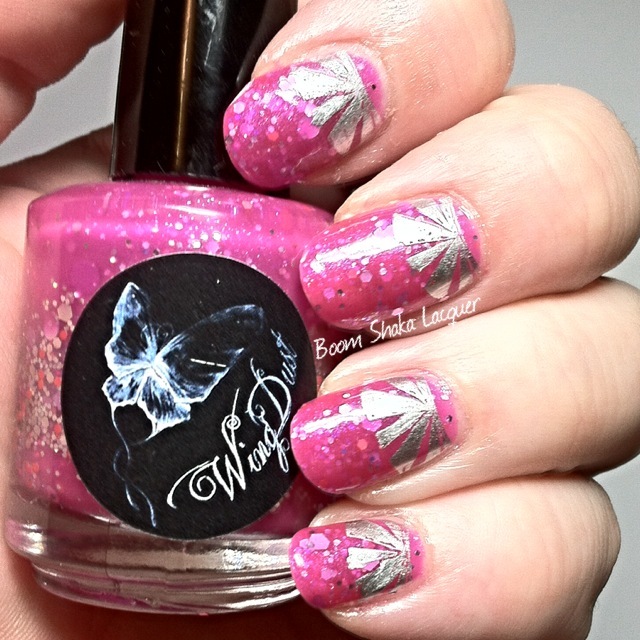 This entry was posted on June 18, 2014, in Nail Art, Nail Stamping, Wednesdays We Wear Pink, Wingdust Collections.